Calgary Stampede July 6-15, 2012 Travel in a Luxury Motorcoach. 1888 The Agricultural Society purchased 94 acres of land from the Dominion of Canada and shortly thereafter began to improve the site with a race track, cattle sheds and an exhibition building. This land on the Elbow River has continued to be the site of Calgary’s exhibition since then. 1908 Calgary was the host for the Dominion Exhibition. Government funds supported the construction of an exhibits building, the roofed grandstand, the livestock exhibits building and several barns. 1911 Parimutuel betting (a system in which all bets of a particular type are placed together in a pool) was introduced at the horse races. A new livestock and horse show arena was built. 1912 Guy Weadick produced the first “Frontier Days and Cowboy Championship Contest” soon to be known as the Calgary Stampede. The Big Four – Pat Burns, George Lane, A.E Cross and A.J. Maclean – provided financial backing. 1919 Guy Weadick returned to Calgary to produce the second Stampede, called the Victory Stampede in honor of the end of World War I. The original Agriculture Building with the Victoria Pavilion was completed. 1923 The “Calgary Stampede” merged with the “Calgary Industrial Exhibition” to form the “Calgary Exhibition & Stampede.” Guy Weadick moved to Calgary to produce an annual Stampede at the same time as the Exhibition. He invented chuck wagon racing, downtown attractions and the other community activities that brand the Stampede today. 1959 The Big Four Building officially opened and included exhibition space and a curling rink. 1965 The Calgary Exhibition & Stampede considered several expansion options, including Lindsay Park, Lincoln Park and Victoria Park but remained in its Victoria Park location. 1968 City Council approved Stampede Park expansion north to 14 Avenue S.E. Under the agreement, no houses could be removed without city approval and not until alternative accommodation was found for the residents. Community studies and consultation began. 1974 A new larger grandstand with a 5/8th mile racetrack and infield was built. The Indian Village was relocated, Suntree Park was completed and the Kinsmen Elbow River Park initiated. 1977 An independent study reflected the rising power of the tourist and entertainment industry and recommended large versatile facilities based on a grand, themed western motif, renewing interest in Stampede Park expansion. 1980 Olympic organizers recognized that a major arena was a prerequisite for the city’s bid for the 1988 Winter Olympic Games; the Coliseum (Saddledome) was built. 1991 Results of the community-initiated Spirit of Stampede workshop supported growth and development of the Stampede as a year-round tourist attraction in conjunction with redevelopment of the surrounding Victoria community as a high-density mixed-use residential, office, retail, and entertainment precinct. 1998 The Victoria Park Redevelopment Committee (VPRC) was established with the mandate to provide constructive feedback regarding Victoria Park redevelopment and to act as the link between the East Victoria Property Owners' Association, Victoria Community Association, the Calgary Flames, Victoria Crossing Business Revitalization Zone, the Calgary Exhibition & Stampede and the City of Calgary. Council agreed to a Park expansion proposal developed by the VPRC and the Stampede to revitalize the Victoria Park area and to encourage the Stampede’s future growth. The eight-block expansion area extended north to 12 Avenue S.E., between Macleod Trail and the Elbow River. 2000 The Roundup Centre addition was completed (the City added eight acres of land to the lease, bringing the total to 151.32 acres). 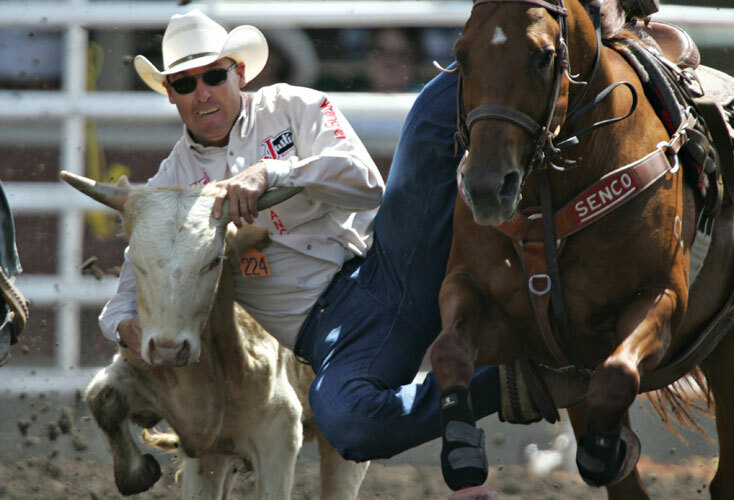 2004 Calgary Exhibition & Stampede released an updated and detailed expansion and development plan—a 15-year, $550 million package of projects. 2005 An environmental committee was formed to address growing need to minimize the organization’s environmental footprint though recycling, reducing and adopting operational practices that respect our land, water, and air. 2006 Property acquisitions were completed (Stampede Park was then 193 acres). 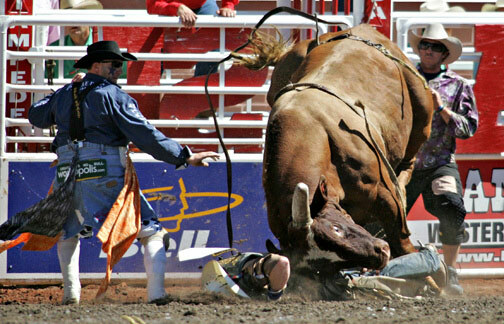 Calgary City Council approved land use for Stampede Park, opening the way for development to begin. June 2006 The Stampede announced plans to transform Stampede Park from a parking lot into a park over the course of several years. The greening project will replace asphalt with trees and reclaim the riverbanks towards the creation of a green oasis right in the heart of Calgary. September 2006 Stampede Park Development Plan projects begin with the construction of a new and relocated Stampede Casino. This marked the first major step in fulfilling the vision of developing a world-class, year-round gathering place for Calgarians and visitors. July 2007 The Government of Canada announced a $25 million grant in support of Calgary Stampede’s greening project. July 2007 Work began on the $50 million expansion of the Roundup Centre, fully funded through Government of Alberta grants. The additional 50,000-square-feet of exhibition space will meet growing demand in the city and will be completed by late Summer 2009.